So here are my notes. Hope they give you some information, insight, inspiration and other words starting with ‘i’, as well as starting other letters. Natasha is Keeper of Medicine at the Science Museum in South Kensington. Keeper is an uber curator. There is a keeper for each of the three arms – Science, Medicine and Engineering & Technology. The group of science museums came into being due to Prince Albert – Queen Victoria’s consort. The Science Museum holds over 300,000 items, including Stephenson’s Rocket and the first Puffing Billy. It also now incorporates an IMAX cinema. With partnerships with major museums in other cities in the UK, they experience significant visitor numbers each year, including a large proportion of international visitors. Audience investigation is a key part of what the museum does. The current model does not look at the background of the individual, but how they access culture. They built the model based on a survey of 3000 households in London. They determined that 20% were not users or potential users and that group were given to the marketing team to reach out to. 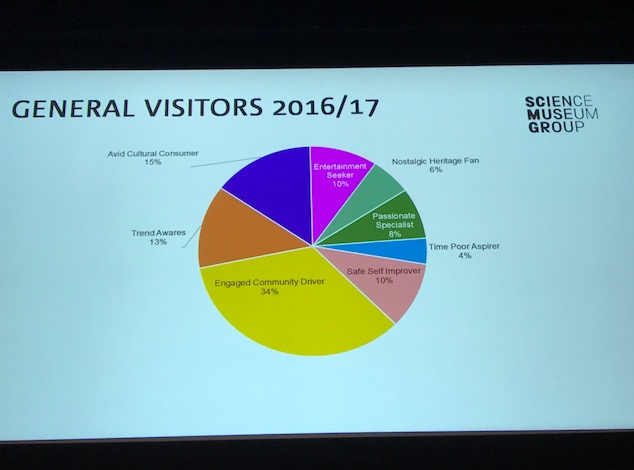 The rest were divided into the groups below and although it is a blunt instrument, but it is also very fluid – people can change between groups depending on a wide range of factors, including demographics, who they visit with, museum being visited etc. As all cultural organisations, the museums have engaged with social media, including a very amusing Twitter competition. The Twitter feud garnered international attention and was extremely well received. It was totally spontaneous on the day and the team of five curators at the Science Museum had a lot of fun trying to come up with humorous responses. However, care needs to be taken, as quick and limited responses can be taken out of context and cause unintended effects. Florence Nightingale Digitization Project is working to digitize the thousands of letters written by Florence – over 20 international organisations are already involved, and more are in the pipeline, as here correspondence is prolific and distributed around the world. The project is being managed by Boston University – which holds the largest collection of her letters. There is an ambition in museums and libraries that we make our collections accessible digitally. We need to carefully consider how users will access the content and ensure that it is made available to them in those ways – rather than putting content online and sits in the corner of a website, unused. The Science Museum began a project to digitize and interpret their collection for an online audience. This project has been funded by the Welcome Trust. The medical collections at the Museum are predominantly owned by the Welcome Trust (70%), by Welcome – a rich pharmacist and obsessive collector of items but is cared for and curated by the Museum. The Museum works closely with medical humanities and biomedical research to further collect for the museum. The digital project uses short text, interactive games, images, books, videos and more. A famous book is accompanied online by an interactive game which explores the operation of the human body and how our understanding of it has changed over time. It also includes text only and sign language options. The aim is to give the user an experience of humanities grappling with the concept of health, over time. Their iron lung online exhibit, not only included an interactive portion, but had to include some context, as most people accessing it would not know much about polio and the sufferers use of this equipment. Context is so important. The museum navigated this issue by including a personal story of a polio sufferer and their experience of an iron lung. Presenting the collections this way (through the Collections Online site), dramatically improve discoverability. (cigarette smoke enema – to help revive near drowning victims). The Science Museum has a master plan which is managed by a department including strategists and planners. They are at the end of the first stage of the plan. The first outcome was a new gallery which explored the Information Age over the previous centuries – it explored things like how technology helped save Titanic survivors and the experience of women telephone operators. They have the server that Tim Berners-Lee used to create the first webpage – it has a note on it saying don’t turn it off – if it had, the whole World Wide Web would have been shut down! The next gallery is the mathematics – only 120 items are displayed, but it aims to show how mathematics is used in everyday life. Extremely interactive. The new museum galleries are due to open in 2019. It will take up the whole first floor of the Museum and will include five themes – and interactive and live exhibits. Will include a pharmacy store replicate, a padded room, medical instruments – with an interactive experience of their use and will also include sign and text. They will also provide content to digital users who may never visit the physical space. Touch objects have been a huge success in the Information Age display, so will be heavily used in the new Medicine galleries – using replicates. Although of value to sight-affected users, it is also very popular and significantly accessed by all users. Areas of difficulty including fair representation of different demographics, particularly children. Representation of health treatments that are not medically supported – would people take this as meaning the museum endorses the treatment? The biggest focus is that of the patient – the museum is working with the historical record and with current relevant community groups to ensure real stories are heavily included in the content and interpretation of the collection – both physically and digitally. Paper talks about how to be digitally literate. Helping people to become digitally literate needs to be practical, informative and fun. It incorporates the skills of creation as well as consumption. It is important to know the makeup of your community, so that you can then program according to the needs of your community – supported by research and by asking your community directly. They used feedback forms, their annual IT needs survey and anecdotally. The IT Needs survey is aimed at all library users, not just those who have attended library classes or one on one sessions. Some of their requests include Office programs, making videos, holidays, banking, homework etc. Respondents are most interested in internet security, Mac/apple, Windows 10 and phones. Computer classes, one-on-one sessions, workshops and expert talks were all very popular options. In recording of 65 one-on-one sessions, the most popular topics were basic computer, email, Wi-Fi, laptop, apple, password, android and Facebook. The relationship graph below tracked the interrelation between topics covered in these sessions. Topics are quite diverse, so staff need to be adaptable and learn in a wide range of areas. The one-on-one sessions aim to help people become more confident with technology. But what is not reflected is the reaction of users – relief, concern, overwhelmed and much more. Library staff can be supportive, non-judgmental and help people work through the issues and if they don’t have the answer to the problem, help find one. Wyndham Libraries have adapted their basic computer classes to five weeks and spun off specialist topics such as Word and Facebook into different classes. They have also started running classes in the library rather than a meeting room, using laptops due to renovations at a branch that limited space. The team is working with Code Club and running programs for primary-school kids – each session running with 10-15 kids. Partnered with a local high school and used Makey Makey project kids in 2017. Have had pop up augmented reality programs during Seniors Week in 2017. Virtual reality sessions for young adults during study time, as well as gaming nights, and a digital photography bus tour. Key messages – teaching digital literacy skills I relevant, help people to create as well as consume, get feedback to create new courses, implement programs for discover audience and needs, have fun! Programs must be agile and reflect community needs. SLNSW is half way through a 10 year project to digitize some of their most important collections. Amongst this is their fragile heritage collections, including magnetic tapes, glass frame images and more. To improve access and discoverability, SLNSW is utilizing crowd sourcing methods, so that the “collections are accessible, open, connected and usable to all.” But crowd sourcing must fit your library, your project and your users. SLNSW has learned a lot about their users, including their preferences, interest and habits. This has helped to better plan and run their projects. Their first crowd sourced projects were early in the 2000s were volunteers transcribed James Cook’s and First Fleet journals using Word, which was then linked to the catalogue record. A project to digitize World War 1 content was not going to be ready in time for the centenary, so they developed their own too, using the Drupal Content Management System, using ideas from other such tools overseas. Started development in 2013. All relevant content has now been digitized and is available for users. Tool has moved from prototype to business as usual and includes improvements and new design features based on the feedback of the users – the transcribers. They can transcribe and see their transcription on the same page as well as being able to add review on completed work. They ran a Transcribe-a-thon to digitize the Sir Joseph Banks collection – which comprises many short letters, but needed to be transcribed on a time limit. It combined a program in the library which incorporated physical items, curated talks and encouraged users to login to do the work online. When they opened the doors at 9am on Saturday, they flooded in. Interested people included Banks enthusiasts, 18th century enthusiasts and library supporters. PCs were available, but people brought their own devices. 100 people attended and there was great camaraderie and collaboration, resulting in over 500 pages being transcribed on that day. A second transcribe-a-thon was run with university students, which although a very different audience, was very successful. Over 5000 pages of the 9000 have been transcribed and over 2000 have been published. This has included overseas users, particularly from the UK. Have also worked with their oral history collections, including Amplify – transcribing oral histories. Some people who gave their interviews in the 1990s, ended up transcribing their own interviews. In 2018, SLNSW will work with NSW Public libraries to help them digitize and transcribe their oral histories on Amplify. A lot of work has also been done with old maps and geolocation. In the background, a lot of work has been done to integrate this content into the catalogue and discovery layer. Harnessing volunteer’s own passions, engage deeply with unique cultural heritage collections, ensuing discoverability, audience engagement and value adding to our heritage collections. The Digital Inclusion Index measures the digital divide in Australia. Queensland’s ranking has improved over the previous years, but the Aboriginal index dropped. Data does not include remote communities, so the figures are likely understated. Examining their community needs showed that solutions need to be mobile accessible, affordable and/or requires access to public PCs. Indigenous communities in Queensland have created their own private Wi-Fi networks, to enable their communities to access and utilize the technology – including having a dedicated emergency network for disaster response. There is a recognition that this is a digital economy which needs to be accessible to all – #notanothergap to ensure that the divide in access and digital inclusion is closed. “Deadly digital communities” is a SLQ project which ran with Telstra and the Queensland Government to help indigenous communities to “Learn deadly digital skills at a free session near you.” The program is run in partnership with the 12 Queensland Indigenous Councils in Queensland. Programs are run through Indigenous Knowledge Centres throughout Queensland and worked with the coordinators and the elected IC representatives. 24 centres are located through Queensland and they will ultimately be working with all of them. They have started with a few and have learned valuable lessons. The sorts of things they are learning include how to text, how to use Publisher to create posters, researching the history of an area using Trove, digital storytelling, working with Heritage organisations and much more – based on community needs. Other challenges including the rarity of internet connections for personal homes (generally saved for businesses), compatibility of software and hardware, frequency of updates and repair (isolated locations may only be visited by tech staff rarely). Digital inclusion = social inclusion. Start with user needs, improve access, motivate people, keep it safe, work with others, focus on wider outcomes. Field notes are a primary source documentation of scientific field observations and data collection. They are a unique source of information and very particular to the scientist. However, digitizing them can raise some interesting challenges – including readability, cross-references to other sources, copyright – around data taken from other sources, the scientists version of shorthand. Aside from the field note books, the collector will also take samples – the value of which is based on whether there is the relevant collection information connected with the sample. But even without, just knowing it is a sample from a specified data and time can be valuable – although after an age, the specimens need much care due to their fragility. Deakin University was fortunate to receive the entire collection of Gill’s and Harvey’s field notes and specimens, along with the relevant permissions. Once the initial challenges above are faced, there are further challenges that arise in the digitization process. Deakin’s umbrella of digitization covers Plan and select; copyright check; dispatch; receive and quality check; metadata/discovery; exhibition; promotion; review. Any project can be stopped anywhere in this cycle, but any projects that come to a conclusion are stored in the Deakin Repository. They sought specialist advice of external sources – for samples it was taking photos that they sought advice from the Herbarium – which had done such projects before. This resulted in preservation standard results. Botanical researchers were also sought for advice, so that they are being presented with the content they are looking for. Although they had permissions for the Gill note-books, further permissions needed to be sought from photographer’s descendants for pictures taken and more. Fusion – Deakin Exhibits Online – see what is there thus far from these two collections. They have also hosted exhibitions with good media coverage. Learned: need collaboration, both internal and external; project scope, management and timeframes will change, digitization methods, standards and challenges will arise, technical challenges will arise, as will copyright challenges – regardless of how well you have planned. The project aimed to explore stories of those who were involved in and after the war, exploring the stories of local areas and families and recording how the centenary was commemorated. This was created to enable researchers to discover. The project was predominantly about the diaries, documents and more of SL, which they digitized. However, they were unable to purchase or have donated relevant content, so have a digital only option where the content was borrowed, digitized and then returned to the owner. Discovering the content to digitize, was facilitated by exhibitions which brought together people who then had more content that could be incorporated into the project. Outreach programs were developed, around creating stories of the war experience in Queensland communities. These stories were grant funded and involved partnerships in these communities to create them. Workshops were offered to remote communities, to help them manage and preserve their own collections. Challenges included: making connections between related items in diverse collections; creating and managing the data that would make this possible; issue of ‘dirty’ data – which had no point ‘truth’ – one soldier had up to four names – depending on what source you are looking at – so all names had to be recorded; multiple J. Smiths and there are many variations, which can never be connected to other information. However, when it works, it works well. Francis R. Smith – has connections including his service records, photos and personal correspondence. This is unfortunately rare. Worked with the National Archive and the War Memorial APIs to connect to the records of those institutions. What do we do next? How can we move from small projects to linked data as it is envisioned. Although a lot of money was spent on commemoration, we may not have developed the enduring legacy we would have hoped for. Fifteen years ago, achieved a post-it note ceiling. This led her to exploring different ways of engaging with large groups of people, which would also engage with her spiritual and creative experiences. Acknowledges she has a progressive view of a spirit of place – the understanding of communities and all that means across all dimensions. Spirit of place quote – Relph 2007. Spirit of place is about all aspects of a place, its more than the people, or the building, it’s the digital presence, scientific and indigenous points of view and multiple ontologies. How do we then support and curate all those different perspectives? Mixed reality incorporates a continuum which includes real environment, augmented reality, augmented virtuality and virtual environment. Augmented reality is experiences where graphics or sounds inserted into an environment, which is digital in some way. Deloitte Global 2018 TMT Predictions – by 202 smart phones penetration in adults in developed countries will be 90%. Over a billion smartphone users will berate AR content at least once in 2018, with 3 million being regular users – creating and tens of millions and sharing content weekly. Few companies working in the augmented reality field – Daqri, Imersia, Plattar, layer, Aurasma and Wikitude. Not commercialized widely yet. Showed a video of library collection exploration using way-finding in the library. Two types of Augmented reality – first type is image – which triggers a connection to the relevant content – it’s a visual recognition system. The second type is about location and is about where you and your device are located, or by the placement of beacons. An example of this in NZ is Neighbourly, the Australian equivalent is Nabo – the social network for your suburb. Google will be getting into this market soon with Bulletin. The AR version of this content is being sent information when you are at a specific geographic location. Facebook is bringing out a feature which allows you to see Facebook friends that are close to you geographically. For people in the field, Pokemon Go introduced people to the world of augmented reality – combining AR with geolocation. Next is Harry Potter – large scale story telling processes locating in the physical world. Awhiworld – worked with a small local school to create an interactive experience which integrated a message and content from another dimension, woven into their local community. The curriculum revolved around this project for three months and included discovering portals around the school grounds, social/cultural discussions and more. Guest speakers came to talk about portal activation, sustainability experts and more. Learnt that the partnerships around these projects are crucial – it had to work with what they were doing or wanted to do and innovation happens from unusual meetings. Project involved local police, artists and other community specialists, who were woven into the story. Place – three case studies: the first one was called Place and took place in a local park which was sacred to the local tribe, and facilitated and curated many different sources of information which was then processed back to the community in a new , oral histories and archival content way. This included analysis of soil samples, psychic responses, ECG recording as she walked the site and much more. She identified 7 spots of note on the site and she mixed the various content together and placed them at the locations, through an app. It was amazing in that it facilitated meeting of locals who had never connected before. The Doorway – a project which worked alongside the local protocols of the site of the Marae. There is a welcoming process, which was made digital and virtual. They worked with the elders to work through the process – you start by listening to the welcome, be told the protocols (all done in English and Maori) and then shown way-finding which incorporated stories related to a place on the site. If you faced your camera out, it then displayed those stories overlaying the visual of the site. It was supplemented by items on site which would tell their stories. Papakura Museum project around the Papakura Cemetery – this was not a problem as it was historic (no new internments) and physical tours were already happening. Maggie was able to incorporate the existing commentary, but it had to be recorded onsite to keep the integrity of the content – which raised production issues, which they dealt with. Place Stories (Mataraki) which gave attention and focus to places that were neglected and unloved. People in the community contributed sound content which played louder as you approached the relevant location. It now only gave the story of the area, but also the work of the artists. Awhi Creatures – solve historical information about the town (Papakura) to find the creatures. It helped to promote new or struggling businesses, who hosted the creatures. When found they would move and make noise. These creatures were also used around the school, and helped with induction of new students and were accompanied by physical artifacts as well as songs and more. Awhi Tower doesn’t involve an app – instead it is a water towers with speakers, that when you touch the tower it works like a giant organ. People are working in Melbourne in this field, including Greg Giannis and Stefan Schutt.